"Whether it's as common as make-up or feigning happiness, every person spends time wearing a figurative mask, concealing features, thoughts, or feelings. This month we're taking off our masks and laying bare the truth beneath: how we feel about growing older, how much of ourselves we reveal online and why we chose the picture in our profile... So start thinking about what you're hiding, and what you're ready to reveal by taking off your mask." 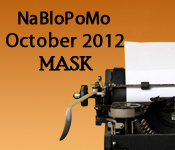 It brings up the question: what is a mask? In popular usage, wearing a "mask" (in contrast to clothes, for example) seems to suggest not just concealment, but a wrongful withholding, even an element of deception -- covering up who we are and pretending to be something we're not. Not everything need be revealed online, of course; deeper, more intimate conversations fit best in deeper, more intimate relationships. But I appreciate the nudge to take off our masks -- to intentionally step away from the false images we use to deceive ourselves and others -- and show up honestly in life.